First held in 1920, the Philadelphia Thanksgiving Day Parade has a vibrant legacy as the oldest Thanksgiving Day parade in America. The parade was created by Gimbel Brothers Department Store for the children and residents of Philadelphia. After Gimbel’s closed in 1986, WPVI-TV/6abc stepped in to continue the holiday tradition that signifies the official arrival of Santa Claus in the “City of Brotherly Love and Sisterly Affection.” With the support of corporate sponsors, 6abc has been producing the parade ever since and it now draws an extensive lineup of celebrities, floats, balloons, performance groups and marching bands. Organizers strive to make the parade “the most band-friendly parade in the country” and they welcome applications from high school, university and specialty marching bands. The parade has 19 spots for marching bands each year and it accepts bands consisting of 90 members or more. Bands are accepted on a rolling basis throughout the year and it is common that bands choose to return every two to four years. 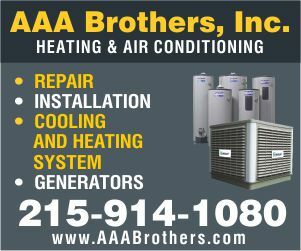 Bands traveling to Philadelphia for the Thanksgiving Day Parade can take advantage of many educational opportunities by touring historic sites such as Independence Hall and the Liberty Bell Center. Many bands also incorporate nearby New York City or Washington, DC into their itineraries. 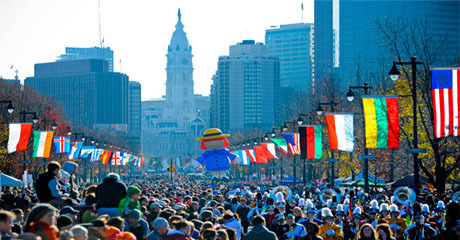 The 1.4-mile parade route steps off from the intersection of 20th Street and JFK Boulevard, turns left onto 16th Street and then left onto Ben Franklin Parkway. The entire parade route is free and open to the public, except for a limited number of grandstand seats in the telecast area that are for sponsors and VIPs only. The telecast area is located near the end of the route, directly in front of the Philadelphia Museum of Art. The parade is aired live on channel 6abc and is syndicated to various markets east of the Mississippi. The parade can also be viewed as a live webcast on 6abc.com. One of the best places to watch is at the parade’s finish at the steps of the Philadelphia Museum of Art. Than the south side of Eakins Oval (in front of the Art Museum) is also recommended. Campbell’s Soup sponsors a tent there where there’s hot food, warm drinks and entertainment for kids. Other locations along the Benjamin Franklin Parkway, like Logan Circle, are also good bets. You can also watch the parade begin at 20th and JFK Boulevard and then take a shortcut on foot heading north on 20th Street five blocks to the Parkway and catch the parade again as it goes by. The parade thrills with an entourage of popular characters from Sesame Street and Disney in floats and giant balloons. And Santa himself arrives in grand fashion, ushering Philadelphia into the holiday season. This year’s parade promises to be nothing short of a visual and celebratory feast. So bundle up, grab the kids and head out for an early holiday treat. You can warm up in the Campbell’s Winter Wonderland Expo Tent with some hot cocoa and look out for special guests and giveaways. If you are looking to eat out for the holiday, check out our Top Restaurants Serving Thanksgiving Dinner.